Consider Sample Input 1, which is illustrated in Figure K.1. There are a total of three round tours for these sites. Some company is assigned road 1-3. It must also be assigned some road on the round tour 1-2-3-4-1, say 2-3. But then it is assigned to two of the three roads on the round tour 1-2-3-1, and no other company can match this – so there can be no other companies. In Sample Input 2 there is only one round tour, so it is enough to assign the roads of this tour equally between companies. Figure K.1: Sample Input 1. 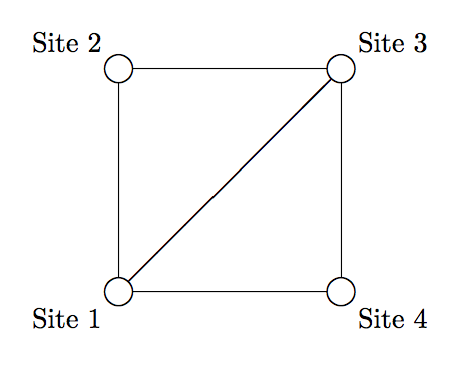 The first line of input contains two integers n (1 ≤ n ≤ 2 000), which is the number of sites in the park, and m (1 ≤ m ≤ 2 000), which is the number of roads between the sites. Following that are m lines, each containing two integers ai and bi (1 ≤ ai < bi ≤ n), meaning the sites ai and bi are connected by a bidirectional road. No pair of sites is listed twice. Display all integers k such that it is possible to assign the roads to k companies in the desired way. These integers should be in ascending order.